It will take fans of the earlier editions of The Star Trek Encyclopedia: A Reference Guide to the Future, Revised and Expanded Edition less than a dozen pages of browsing to realize the enormity of the material–and the effort–required to update the previous 1999 edition for this 50th anniversary boxed, hardcover, two-volume reference published this week. Enterprise–the series that has been virtually ignored in Star Trek reference publications, finally gets its due, as does the later seasons of Voyager, the last season of Deep Space Nine, and the films Star Trek Nemesis, Star Trek (2009), and Star Trek Into Darkness. 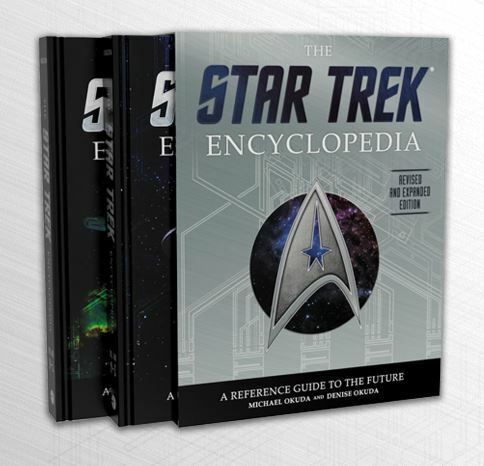 An invaluable reference until the creation of the online fan-run Memory Alpha, the original three editions of the The Star Trek Encyclopedia were the only place for fans to get quick Star Trek data with the last update in 1999. The advent of the Internet seemed to have spelled certain doom for any hope of a revised and updated edition. Memory Alpha has more than 40,000 pages of detailed Star Trek reference data. 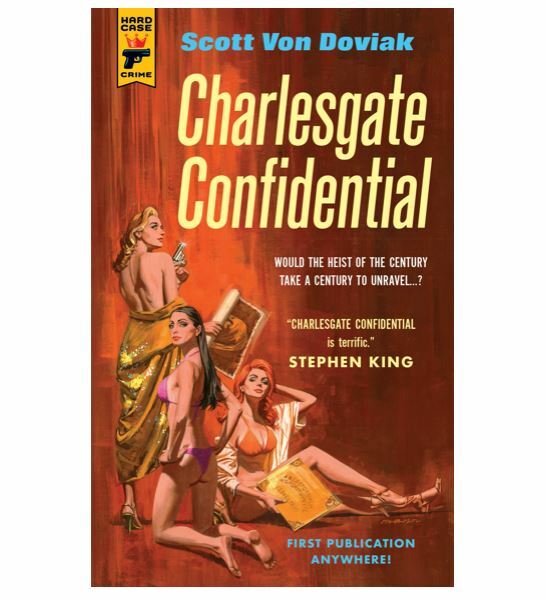 How could a 1,056 page two-volume edition compete? For one, long-time fans of all or many of the Star Trek series likely appreciate the ability to pull a reference book off the shelf. Memory Alpha’s recent updates make the website difficult to navigate and website TrekCore’s value is very much in its screen captures. Star Trek reference works have been very sporadically released in the past 20 years, so fans are always clamoring for a new book. The Star Trek Encyclopedia is very much an encyclopedia, and many may not remember the days of pulling a volume of an encyclopedia off the shelf and reading it through for entertainment. This is a great set of books to do just that. And the detailed content is what fans want. Excluding this summer’s release Star Trek Beyond, original edition creators (and former Star Trek art department creative gurus) Michael Okuda and Denise Okuda craftily and seamlessly weaved the J.J. Abrams’s movies–called the Kelvin timeline now– into this work as explained in their foreword (only Star Trek (2009)’s villain Nero’s entry, for example, bridges both the Prime timeline and the Kelvin timeline in The Star Trek Encyclopedia). The Star Trek Encyclopedia is also the first publication that thoroughly addresses the nuts and bolts of Star Trek Into Darkness. 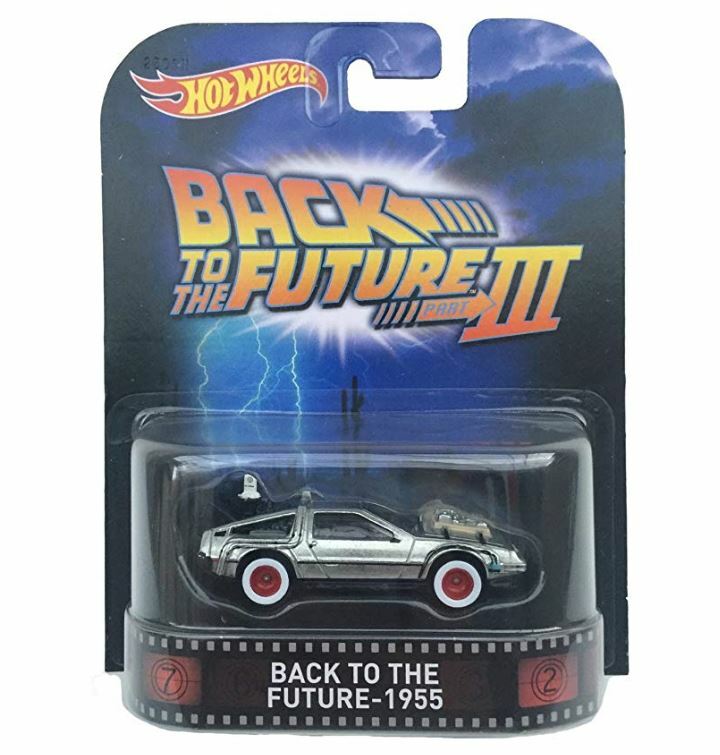 I came up with a list of my favorite items: references, characters, objects, and places that did not turn up in the past editions, to see if they all were now included. 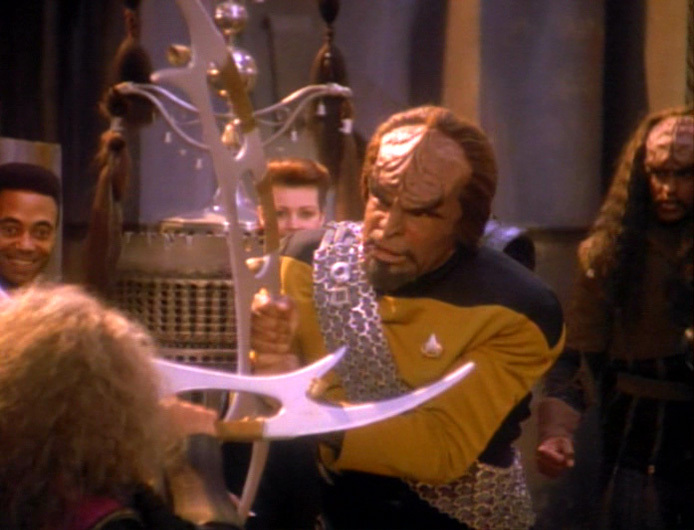 They were, except for entries and images of certain key alien weapons, uniforms, and artifacts from the Kelvin timeline (like John Eaves’ beautifully designed Klingon weapons, Romulan disruptors and rifles, or the new Klingon uniforms and helmets). These types of updates are present across the board for Enterprise, Deep Space Nine, and Voyager. Artist Ian Fullwood updates Doug Drexler’s artwork quite well, adding to his work updates with the same look and feel as Drexler’s original creations. 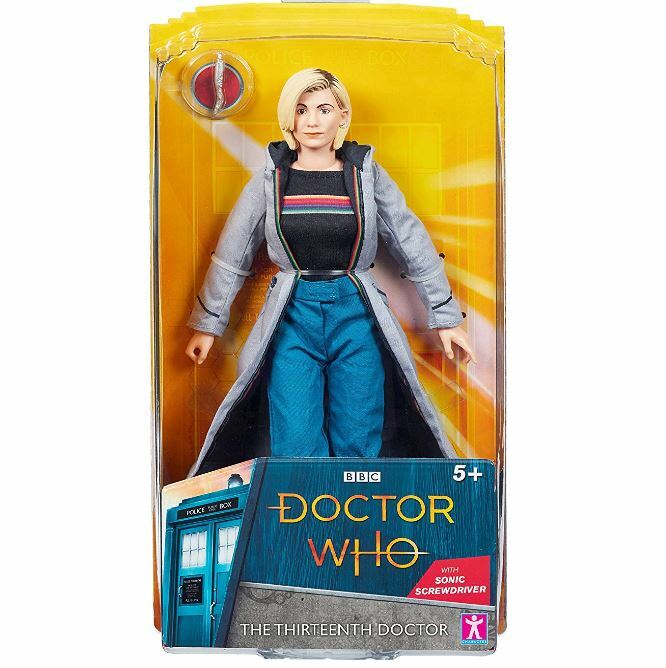 Don’t expect past entries to be updated other than some have updated photographs–the research and preparation was clearly all about the new series and movies, also what the fans want and expect. What is the most iconic Star Trek prop? It’s a question die-hard Star Trek fans ask themselves: If you could own one favorite Star Trek prop, what would it be? This weekend a Star Trek Facebook page asked thousands of followers to comment on one question: If you could have any autographed Trek prop, what would it be and who would you have sign it? With nearly 2,000 respondents we thought it was a good opportunity to use these responses from across Star Trek fandom to see if we can glean what Star Trek fans think are the most iconic props of the franchise. It’s not all that scientific, since the page posting the question was a general Star Trek page, and many fans may only follow the individual pages from any of the Star Trek series. The image shown in the post was of an original series phaser–did that skew fans to select that prop? Are there more original series fans in the mix who follow this page? We don’t know. But the results are still interesting and who better than a random group of Trek fans to share what they see as the top Holy Grail of Trek props? The question is ongoing, with hundreds more responses entered after we stopped tracking answers–around 1,860. Many responses were attempts at humor–many claiming Shatner’s toupee as their response (how do you autograph a toupee anyway?). Others were rude or sexist or otherwise the typical worthless responses you find across social media on any given day. Also, nobody addressed a key topic–why do people think it’s a good thing to autograph a screen-used prop? The truth is that collectors of screen-used props will refuse to purchase a prop if it has been defaced in any way, especially by an autograph (screen wear and tear excepted). Recent auctions of an original series gold tunic worn by William Shatner sold for a fraction of what a similar one sold for that was not so marked. The autograph literally cost the consigner thousands of dollars. One rare command Starfleet uniform worn by Robert Picardo on Star Trek Voyager was once highly sought after by collectors, and has remained unsellable for years because of a scrawling signature across the front. The bottom line: Collectors prefer a prop or costume to look just as it did the last time it was shown on the screen. Actors would be well-advised to refuse to autograph screen-used props at least without first telling fans they may be ruining their chances to re-sell the prop down the road. Whether or not you think you might keep a prop forever, do yourself a favor and don’t limit your future options. Putting the “should they/shouldn’t they” question aside, the great response showed fans love their favorite Trek and thousands would want a piece of TV or film history signed by their favorite actor. So what did we learn? Tonight dog lovers across the galaxy tune in to their screens for the annual Super Bowl of dogdom, the Westminster Kennel Club Dog Show. 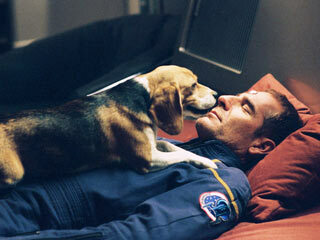 Here at borg.com, this is serious TV viewing, and this year our thoughts naturally turned to… dogs in space. 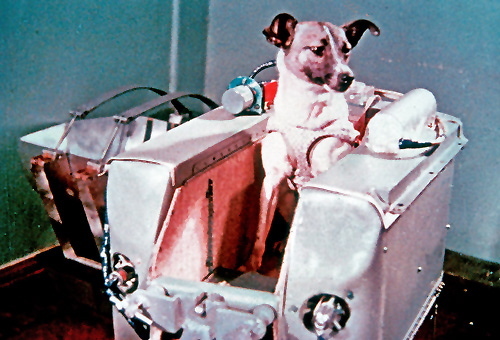 Like Laika, the first dog in space who beat mankind into the outer realms, these dogs have gone… where no man has gone before. So we bring you our very own contenders for Best in Show–our picks for best dogs from genre fiction in TV, movies, and comics (in no particular order). 1. 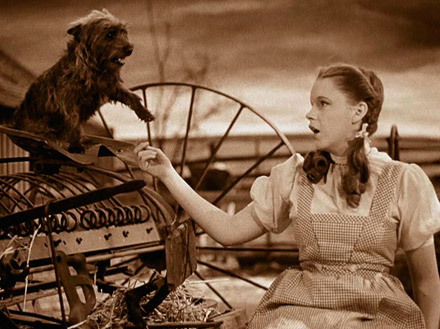 Toto – Who better to start our list than the little terrier feisty enough to take a bite out of Miss Gulch and accompany Dorothy on her journey down the yellow brick road in The Wizard of Oz? 2. 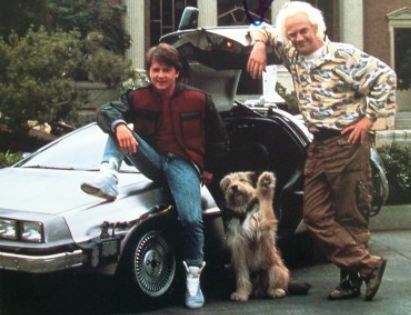 Einstein – Doc Brown’s faithful sheepdog companion, like Laika, was the first to make a historic voyage there and back again in a Delorean in Back to the Future. 3. Fluffy – Two heads are better than one, so three must be exponentially better. 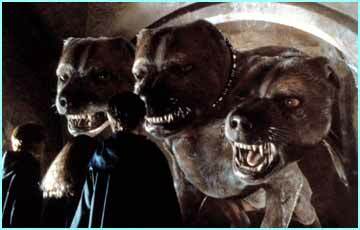 How can you not like this lovable cerberus from Harry Potter & the Sorceror’s Stone? Just don’t let thieves know their secret, that music will lull them fast to sleep. 4. 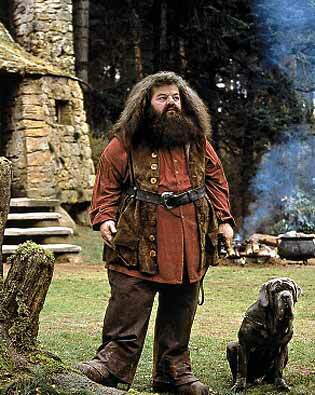 Fang – Speaking of Harry Potter, we can’t pass up the loyal and large pal to Hagrid, Fang the boarhound (played by a Neapolitan Mastiff). Although Hagrid calls him a bloody coward, in The Sorceror’s Stone he took Harry and company through the Forbidden Forest. 5. 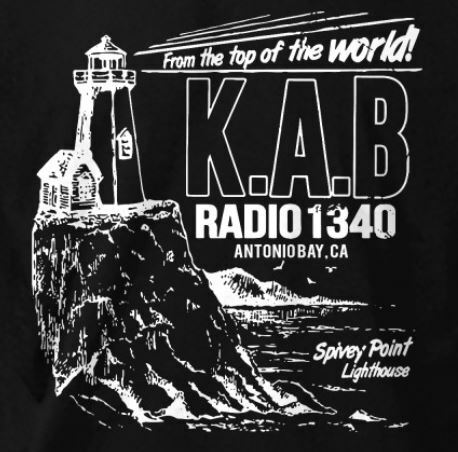 Krypto – Strange how themes repeat themselves. Originally, Krypto, like Laika and Einstein, was Jor-El’s first foray into creating a vehicle to get Kal-El (our Superman) off of the planet Krypton and on his path to Earth. 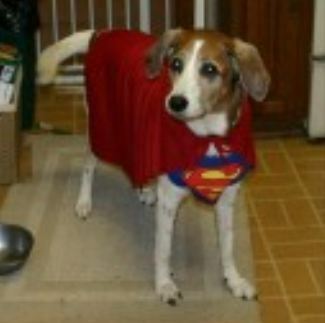 Although a mishap sends Krypto off-course, fortunately he makes his way back to his best friend. 6. 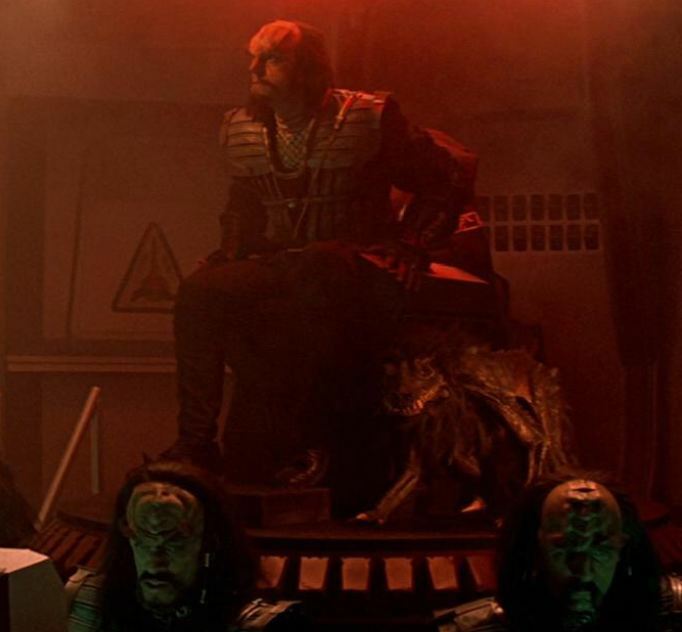 Porthos – We would later learn Porthos would have a pack of offspring of his own per Scotty in Star Trek 2009. 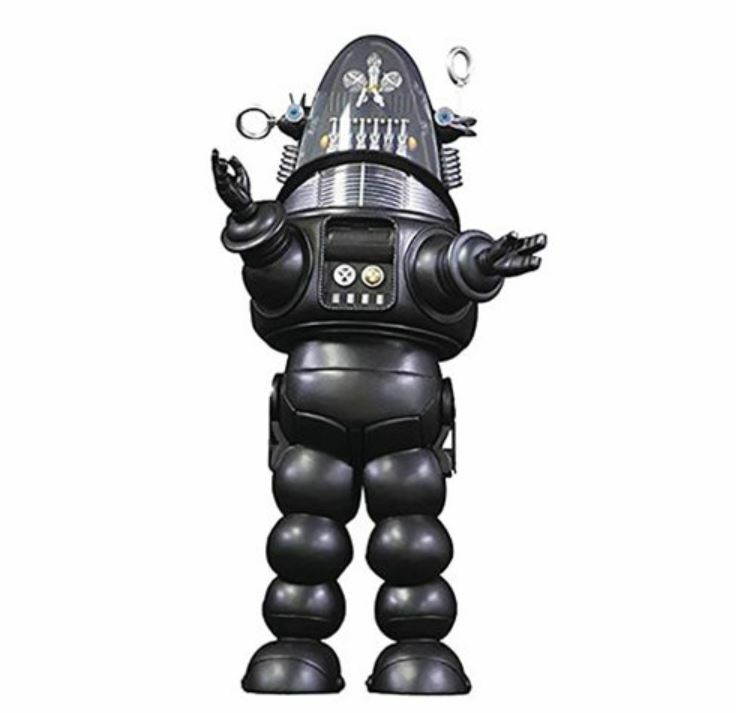 This fellow accompanied Captain Jonathan Archer on many a mission where no man had gone before in the earliest Star Trek stories on the series Enterprise. 7. 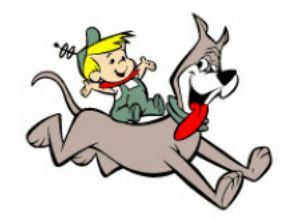 Astro – Maybe the first family dog we were introduced to in the future of our past, Astro loved Elroy, Judy, Jane and George Jetson and showed there are no bad dogs today and hundreds of years from now. 8. 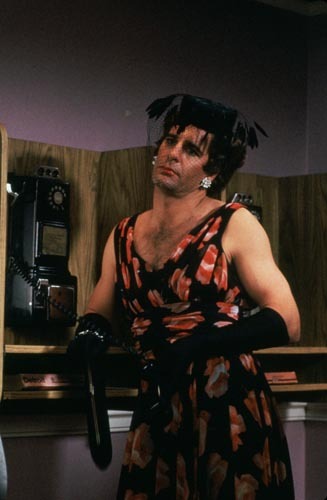 Commander Kruge’s targ – We never learned her name, but this fiercely loyal friend helped make all of us cheer for Kruge when he went up against Admiral James T. Kirk in Star Trek: The Search for Spock. Unfortunately, she represents the one four-legged companion on our list that doesn’t make it, thanks to that dastardly Kirk and friends. 9. 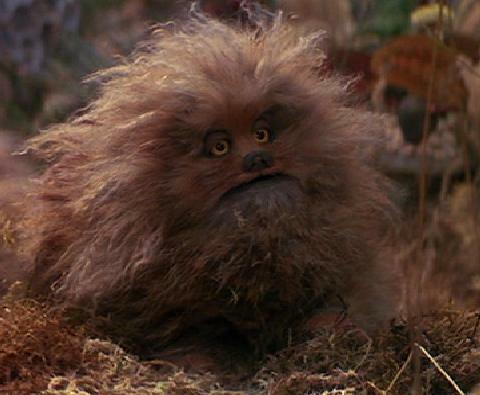 Fizzgig – Seemingly cute and innocent, Fizzgig is the Muppet companion to Kira in The Dark Crystal. Like Kruge’s targ, although not technically Canis familiaris, he had all the qualities of a good buddy and did not hesitate to bear his fangs to protect Kira when he sensed danger. 10. 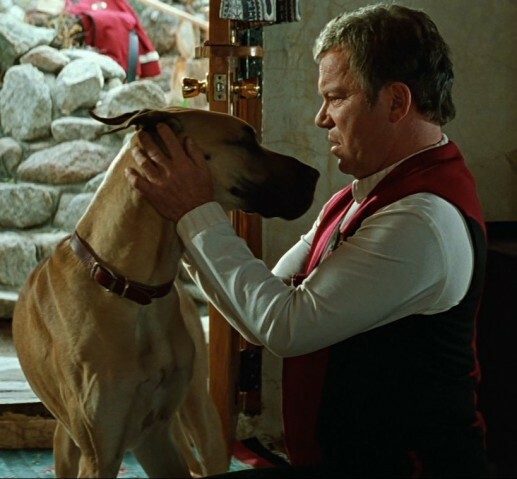 Butler – James Kirk redeems himself in his last mission when he is sucked into the Nexus in Star Trek Generations. His reaction to seeing his dog Butler at his old home shows there was a real guy in that Captain Kirk. 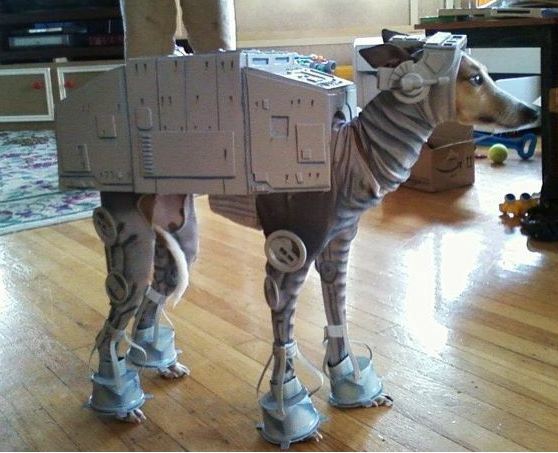 Honorable mention: All greyhounds, since they look like AT-ATs from The Empire Strikes Back. Do you have any others you think should make the list? Let us know, and enjoy the Dog Show tonight! The 135th Westminster Kennel Club Dog Show airs tonight and Tuesday on USA and MSNBC. Only dogs from Earth are eligible. 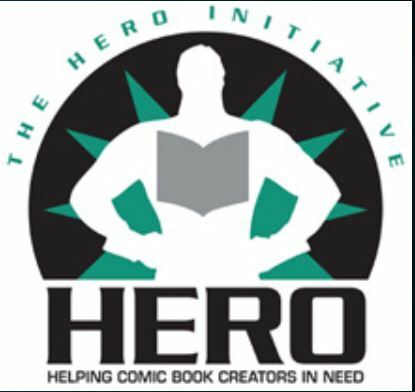 You may have seen the Star Wars vault, the Marvel Comics vault, or the DC Comics vault. 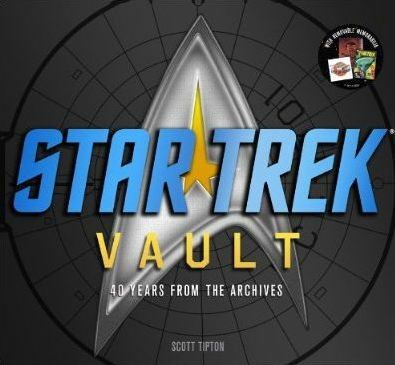 On October 1, 2011, we’ll finally get to see the Star Trek version of this book and fandom memorabilia series as Star Trek Vault: 40 Years from the Archives is released. The 128 page book will be the first Star Trek retrospective book to include behind the scenes details of the last Star Trek series, Enterprise. The book promises to cover all 40 years of the Star Trek franchise, but only the first ten feature films–Star Trek 2009 will apparently not be covered in this release. 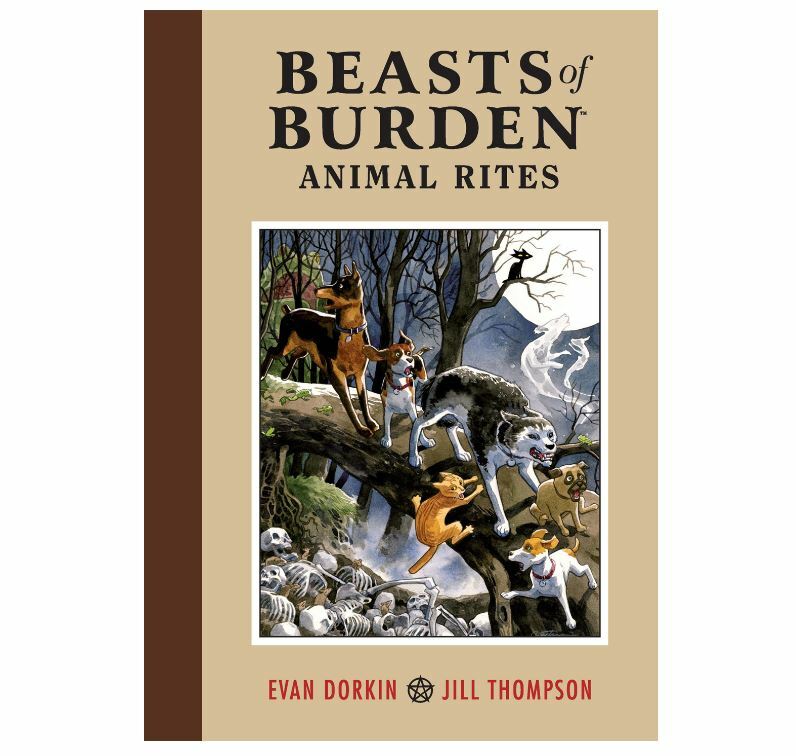 It is available at Amazon.com before its release in October for a discounted price of $26.40. The street release price after October 1, 2011, will be $40.00. 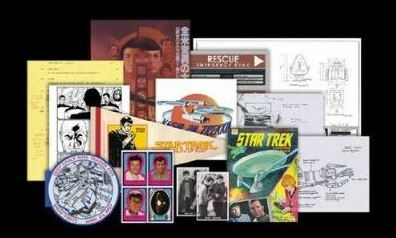 Star Trek Vault: 40 Years from the Archives is illustrated with 350 photos and art images. The extra replicas memorabilia will feature 13 items, including set signage, hand-drawn story boards, blueprints for Picard’s captain’s chair, a vintage comic book, trading cards, patch, pennant, fan poster, Japanese poster for Star Trek IV: The Voyage Home, and a vintage T-shirt transfer. Look for a review of Star Trek Vault: 40 Years from the Archives after its release in October. Past versions of the vault series have been popular and included both good information and fun extras. 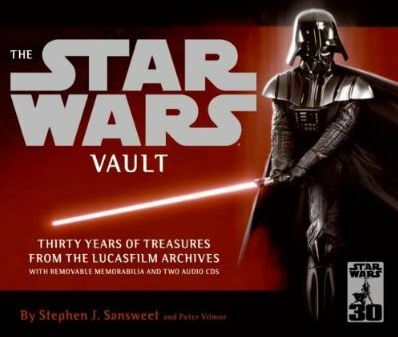 The Star Wars Vault: Thirty Years of Treasures from the Lucasfilm Archives is probably the best of these released to date. 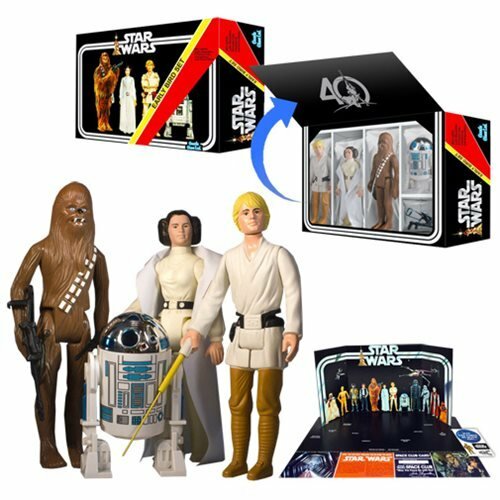 It includes removable reproductions of memorabilia, too, along with two CDs containing vintage radio ads, original cast interviews, George Lucas’ commentary, and Carrie Fisher singing in the Star Wars Holiday Special. It also featured a questionnaire for the first and only test screening of the original Star Wars— and the invitation to attend it, George Lucas’ hand-written treatment for The Empire Strikes Back, Lucasfilm Christmas cards, an iron-on T-shirt transfer, the first concept sketch drawn for Star Wars and blueprints of Star Wars vehicles and sets. 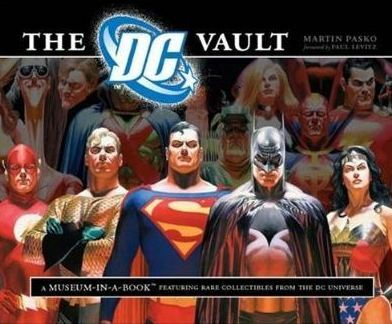 The DC Vault: A Museum-in-a-Book with Rare Collectibles from the DC Universe is another great book in the Vault series, with lots of fun features, including never-before-published memorabilia, early sketches, covers, memos, press materials, a working reproduction of a 1942 Junior Justice Society of America decoder, a series of Public Service Announcements starring Superman and Batman, and the original pencils and inks for Wonder Woman #63. 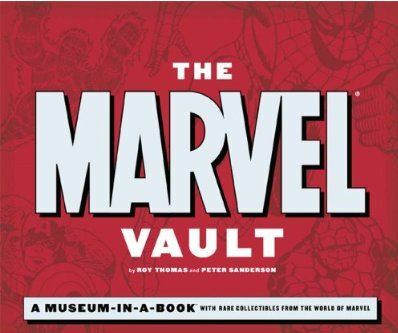 Although it was the first of the bunch and includes a little less by way of memorabilia, Marvel Comics fans and fans of comic books in general will like The Marvel Vault: A Museum-in-a-Book with Rare Collectibles from the World of Marvel . Hopefully the Star Trek version of the Vault will include the best of these past books in the series. Whether you are a Star Trek casual watcher or an uber-fan, whether you are a cosplayer or a collector of real Trek memorabilia, there is always more out there to catch up on or watch all over again. 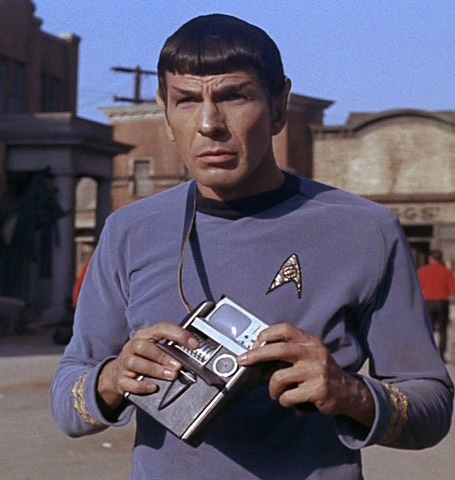 Unlike any other franchise, there is more information available today than ever before in case you want to check out more about a replica of your favorite tricorder or disrupter, or get into real props and costumes. Or maybe you like to make your own replicas, and the more info you have available the more accurately you can create replicas from the Star Trek universe. Resources today fall into four categories: First, the episodes and movies themselves, the primary source material, including the artifacts from the actual shows. Second, websites have an endless supply of Star Trek information on any subject. Third, general reference books have been created by various publishers since the first series. And fourth, auction catalogs get you as close to costumes and props from a show as you can get other than looking at the real thing. 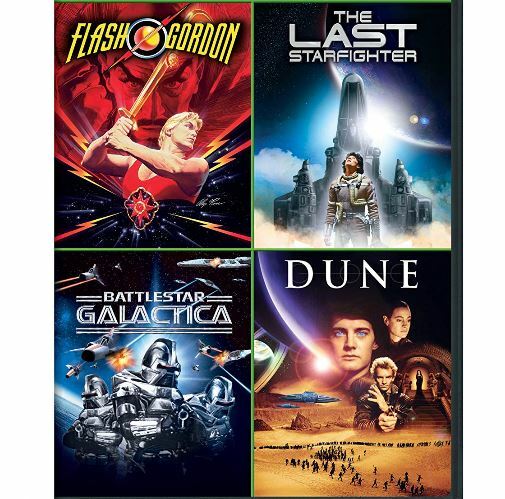 The TV series are available on DVD, Blu-Ray, VHS, and streaming video, by series and in compilations. 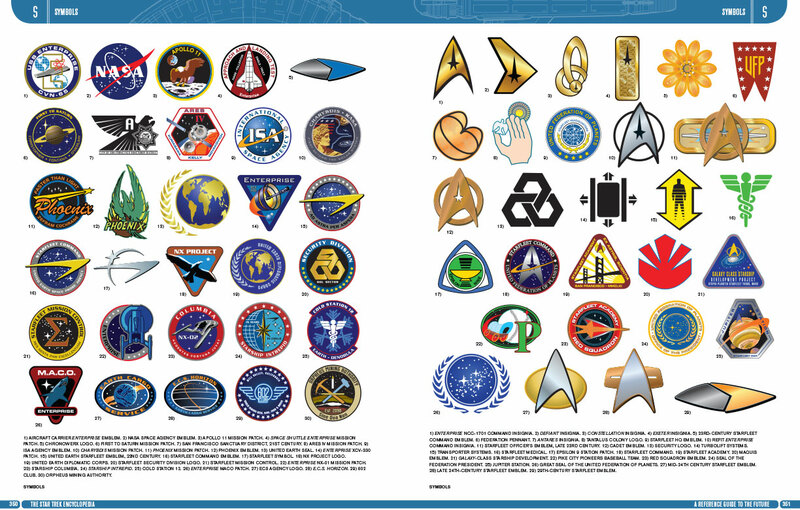 Memory Alpha – A detailed, currently maintained encyclopedia of all things Star Trek. Trek Core – A great source for screen caps of all series episodes, including some HD versions. As to reference books, several licensed Star Trek books are available, some still in print, and the following are what I consider the best resources publicly available. I have also provided links to the books at Amazon.com, but your local library can also get these for you. Today we will run down the best Star Trek reference books for the TV series. Tomorrow we will continue with reference material for the eleven Star Trek movies. (Book cover thumbnails are a bit fuzzy since I used direct links to Amazon listings). Star Trek: The Art of Star Trek , by Judith and Garfield Reeves-Stevens, 1997. If you only have one book about Star Trek behind the scenes, it should be this book. 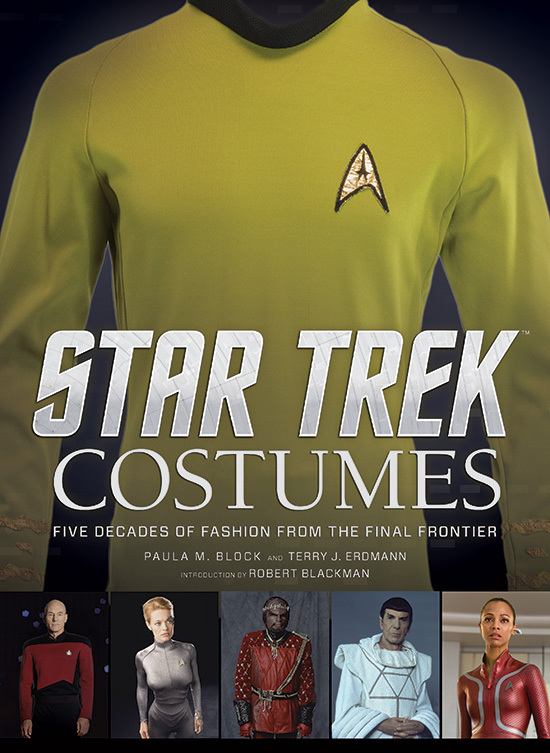 Full of original paintings, behind the scenes photos, and close-ups of costumes and props, this is the best book available on the Star Trek television shows and feature films. If you have it you will read it over and over again. 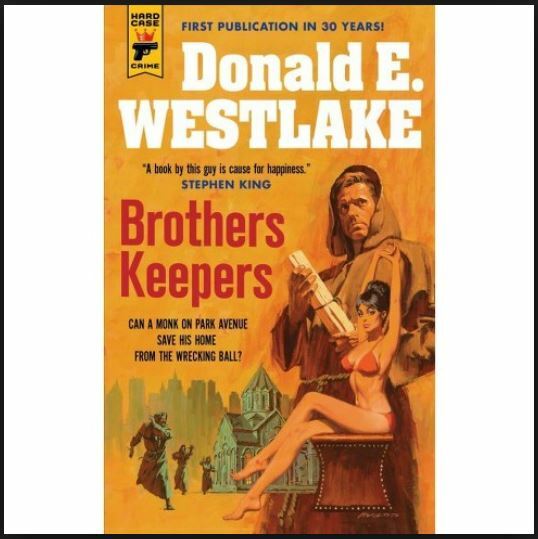 It is only lacking in the fact it was made before Star Trek Generations, so for everything after that you should seek out some of the other suggested books. Also, you’ll notice on this list the Reeves-Stevens are a great source of all sorts of Trek material. Highest recommendation. The Star Trek Encyclopedia , by Michael Okuda and Denise Okuda, 1999. 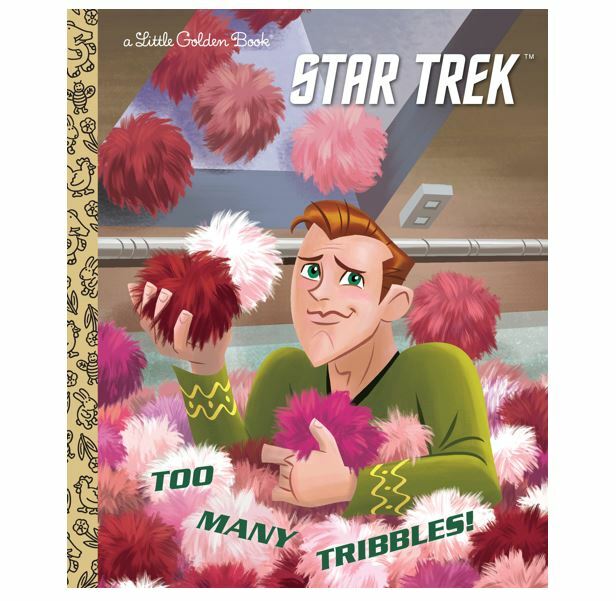 With two Star Trek insiders like the Okudas writing this reference guide, it’s no wonder this is such a popular book. Literally the A to Z guide to the Star Trek universe, make sure you get this most recent version that includes all updates. Unfortunately it has not yet been updated to include the latest films and the Enterprise TV series. Still, a single source for the obscure and the general in the franchise. Highly recommended. Star Trek Chronology: The History of the Future , by Michael Okuda and Denise Okuda, 1996. Another reference by the Okudas, this time aligned in chronological order of the events of the Trek universe, as opposed to the order of production of the series, which is the format of all other Trek reference books. Handy to see overlap between series and whether the Battle of Wolf 359 comes before or after the destruction of Praxis (in case you get confused on that). Star Trek The Next Generation: Technical Manual , by Rick Sternbach and Michael Okuda, 1991. An unprecedented look at the science and technology of Star Trek. The masters of the Trek art production team include here detailed drawings and explanation to support the science behind the stories portrayed in the television series and films. A must for all Star Trek fans. Star Trek: Aliens & Artifacts , by Michael Westmore, Alan Sims et al, 2000. 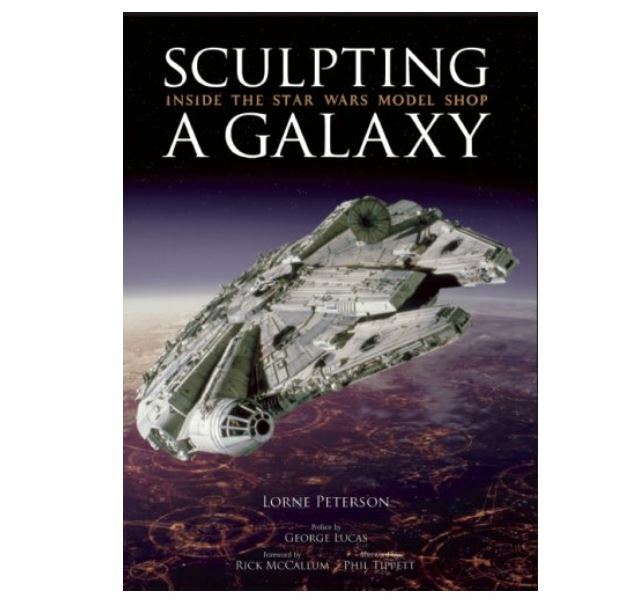 This book provides key views from the main make-up artist and the propmaster for the later Trek series. Lots of close-up photos of alien races and make-up, but a lesser focus on props. Good behind the scenes stories. Highly recommended. Captains’ Logs: The Unauthorized Complete Trek Voyages and Captains’ Logs Supplemental: The Unauthorized Guide to the New Trek Voyages-Entire Deep Space Nine & Voyager History , by Edward Gross and Mark A. Altman, 1996. Although this episode-by-episode guide has has been replaced for the most part by the TrekCore free website, it’s still worth flipping through to find episodes you may have forgotten about. The first contains the original series, the supplement expands into later episodes of Deep Space Nine, Voyager and Star Trek Generations. Inside Star Trek: The Real Story , by Herbert F. Solow and Robert H. Justman, 1996. A source for those wanting an insider’s look at the making of the original series. Not much on costumes and props. A lot of information on the business of television production. Useful here for the impact of the business and budgets on creative decision-making. The Star Trek Sketchbook , by Herbert F. Solow and Yvonne Solow, 1997. Great images of the art of the original series, including sketches and paintings in full color as well as a look at the various Starfleet and alien costumes created by William Ware Theiss. A great art book. Recommended. See Star Trek: The Art of Star Trek referenced above. Star Trek: Phase II : The Making of the Lost Series , by Judith and Garfield Reeves-Stevens, 1997. 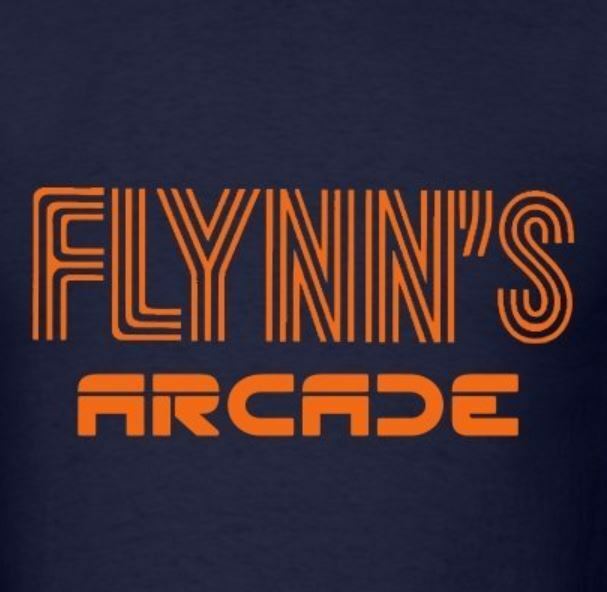 The TV series that never was. The only detailed account of the Phase II series that turned into Star Trek: The Motion Picture after the success of Star Wars. Includes hundreds of pages of material, with sketches and photographs of production material that didn’t make it to the screen. The Continuing Mission (Star Trek: The Next Generation) , by Judith and Garfield Reeves-Stevens, 1997. THE sourcebook for all things Next Generation. Episode summaries. 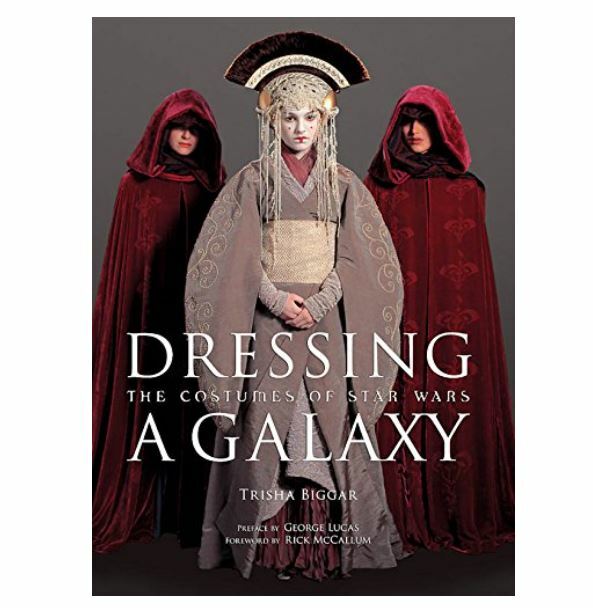 Costumes and props, including photos of original art and design. Text includes the environment in which each season was created. Insight from cast and crew. 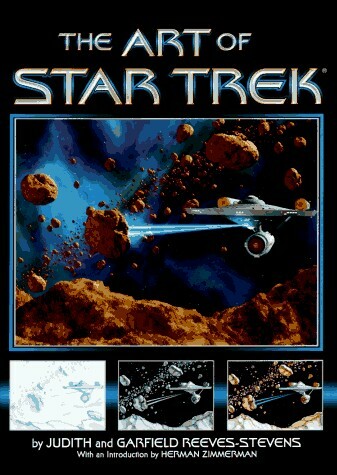 Next to The Art of Star Trek, the best Trek resource out there. Highly recommended. 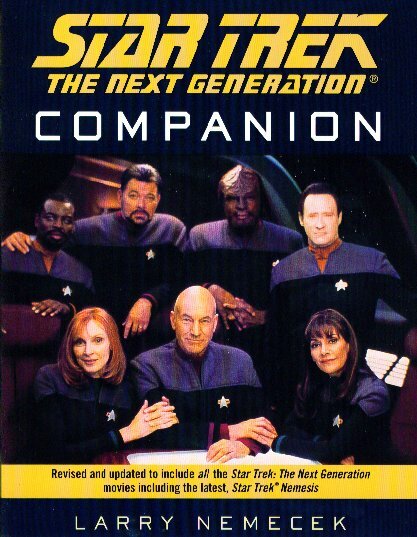 The Star Trek The Next Generation Companion: Revised Edition , by Larry Nemecek, 2003. The only comprehensive look at all Star Trek: The Next Generation seasons and movies through Star Trek: Nemesis. Well researched trivia about each episode and movie is covered. Delves into the world building for the series, including a look at technical and scientific continuity across episodes. Hundreds of good black and white photos. A great book even compared to The Continuing Mission. 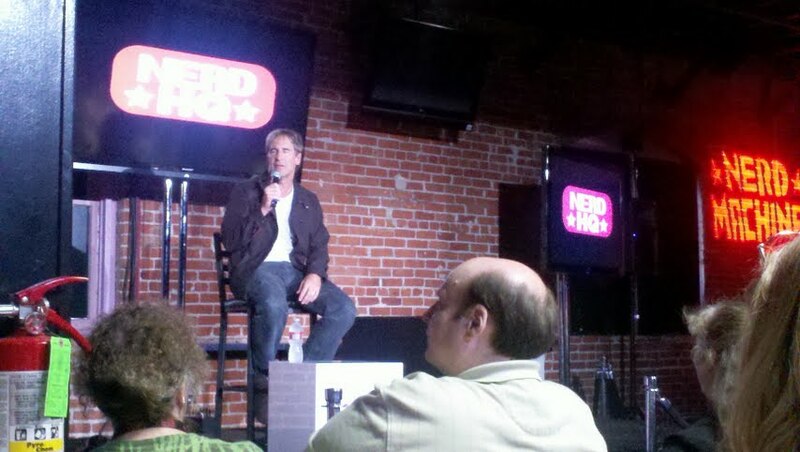 Nemecek shows he really knows his Trek trivia. Highly recommended. Editor’s Update: Check out this new addition to resources from this series: Star Trek: The Next Generation 365 here. The Making of Star Trek Deep Space Nine , by Judith and Garfield Reeves-Stevens, 1994. Lacking only because it was made too soon, this look at Deep Space Nine was created before the third season got underway. It provides good black and white illustrations of props, costumes and set design. This also has some good information on alien creation, including make-up decisions. Deep Space Nine Companion , by Terry J. Erdmann, 2000. 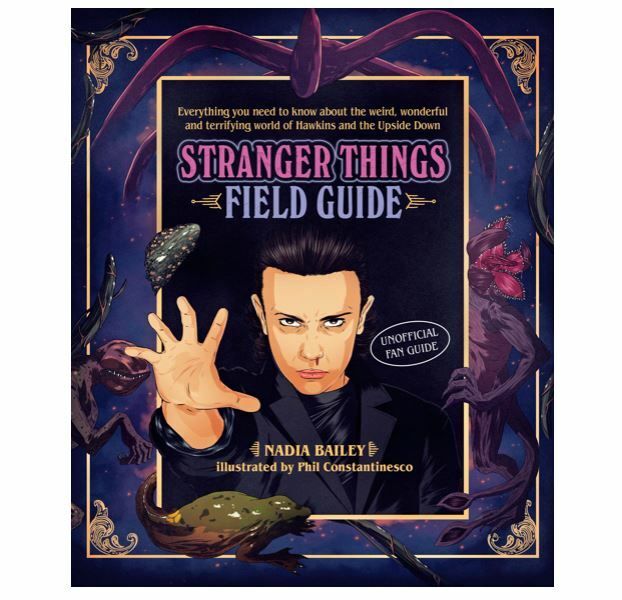 The best book available documenting the series with episode descriptions and behind the scenes information. Recommended. Star Trek Voyager: A Vision of the Future , by Stephen Edward Poe, 1998. I only recently discovered this book. It provides a wealth of information about the business of creating a television show, including insight about Star Trek Voyager’s specific creators and what role each person plays (note several individuals worked on several series so this is a good guide for TNG and DS9, too). The book covers in a journalistic style the background events surrounding a few first season episodes of Voyager. It includes a detailed analysis of what happened when Genevieve Bujold commenced filming as the original Captain Janeway, and manages to avoid “dirt digging” type commentary. 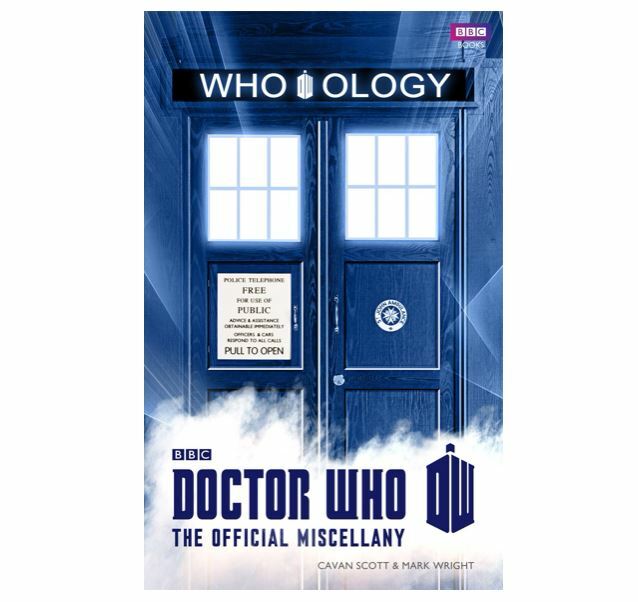 Includes a small peek at key staff such as Alan Bernard, Alan Sims, and Michael Westmore, Michael Okuda, Rick Sternbach, and the entire writing staff. Highly recommended. Star Trek Voyager Companion , by Paul Ruditis, 2003. 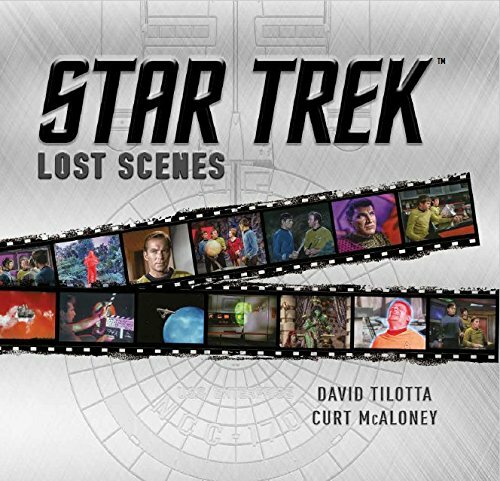 One of the best written of all Star Trek source material, this book delves into each episode with great sidebar material, insight into the cast and crew and hundreds of black and white photos. Highly recommended. Unfortunately, the best resource for Enterprise information is Memory Alpha, TrekCore and the current Star Trek Magazine. One of the biggest gaps in the Star Trek universe is a comprehensive book about the last series in the franchise. Check back tomorrow for some recommended books covering the eleven Star Trek feature films. Day Two of the San Diego Comic-Con proved to be non-stop fun. 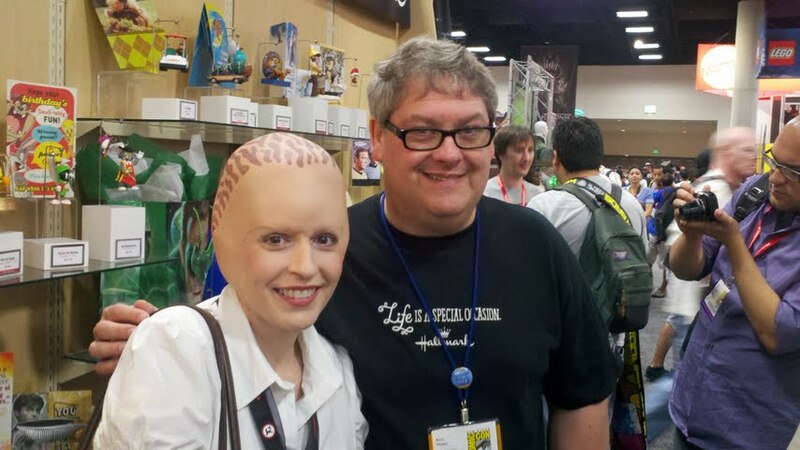 You can’t get the full comic convention experience without at least one day in costume so at borg.com that day was today. Elizabeth C. Bunce and I took to the floor as Tenctonese visitors from Alien Nation who happen to work at the local Buy More, including Elizabeth as a member of the Nerd Herd from the TV series Chuck (with screen-used prosthetic heads from the series courtesy of Prop Store of London, also at the Con). Our favorite costumes are the most obscure and we got about 1,000 fans and press stopping us for photos, several saying we had the most creative costumes of the day and interviews by four TV stations including G4. You certainly get noticed in costume and that also means you sometimes get an extra chance at meeting your favorite celebrities and childhood idols. Chuck himself, Zack Levi, said he loved our outfits and stopped to say “I really appreciate that you’re representing both Buy More and the Nerd Herd.” Sweet! 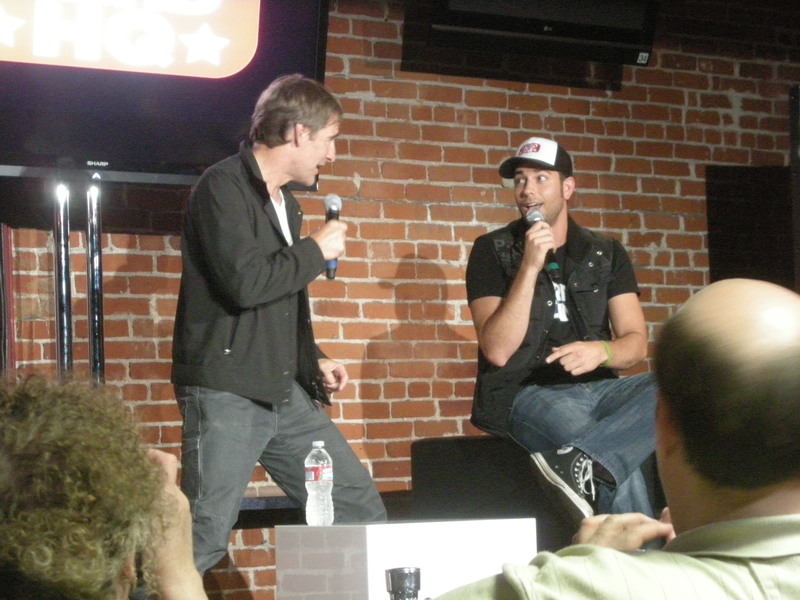 Levi was hosting his own offsite mini con of sorts called the Nerd HQ, where you could skip lines and for a $20 donation to the national Smile charity you could meet Zachary Quinto (Star Trek’s Spock, Heroes), the stars of TV’s Psych, or as we did, get to spend an hour with Quantum Leap, Men of a Certain Age and Star Trek Enterprise’s own Captain Archer–Scott Bakula in a small conversational setting of about 100 people (Scott also gave us a thumbs up and signed autographs). 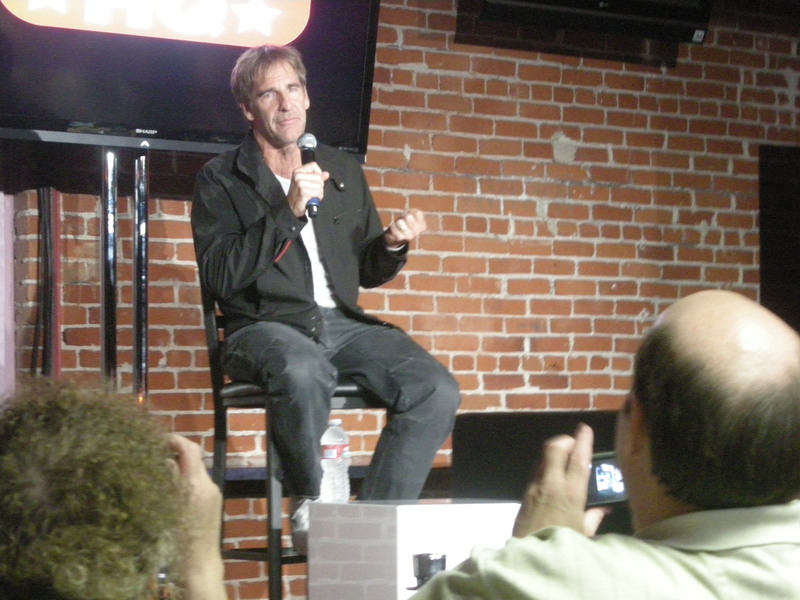 Bakula was more down to Earth than you can imagine, talking about the ups and downs of acting and singing an improvised duet with Zack Levi onstage. 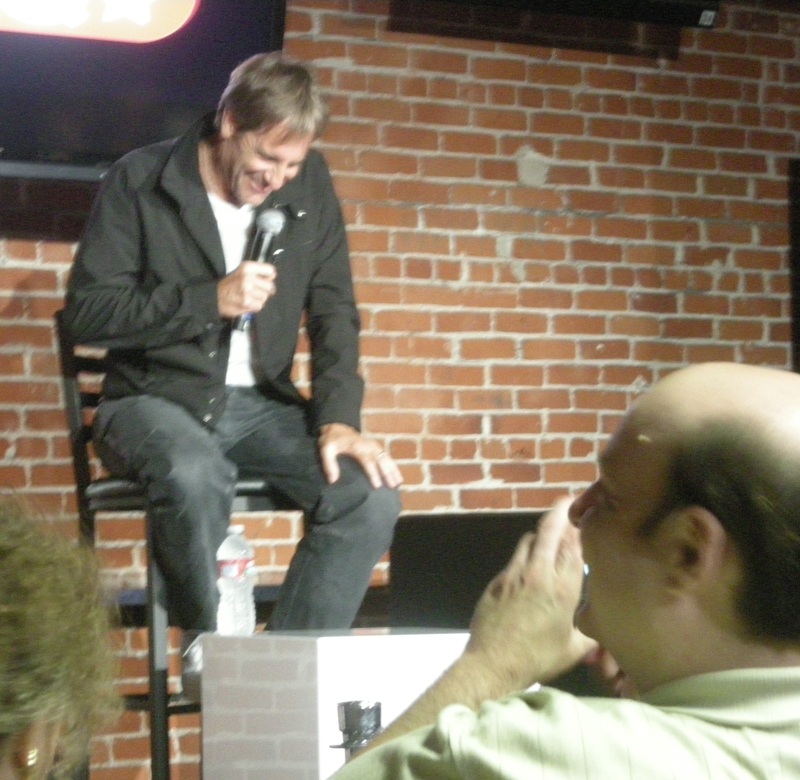 My own childhood hero, Mark Hamill, was signing autographs and we had our own alien to Jedi chat with Mark. Every bit the classy Jedi! We lucked into a conversation with Saul Rubinek, star of SyFy’s Warehouse 13, and we talked about all his past shows including Nero Wolfe, and how much we loved him as our all-time favorite Star Trek: The Next Generation villain, Kivas Fajo. A super gentleman. More on Saul in future posts. 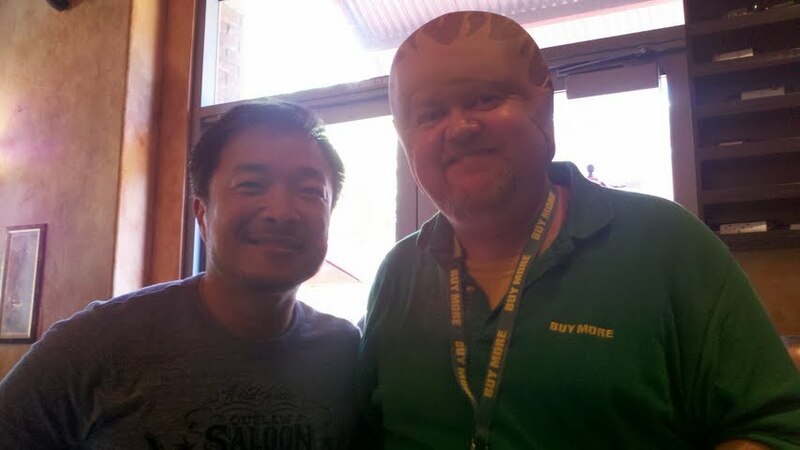 We headed off to lunch and ended up at an Italian eatery with none other than Jim Lee and his lovely wife. 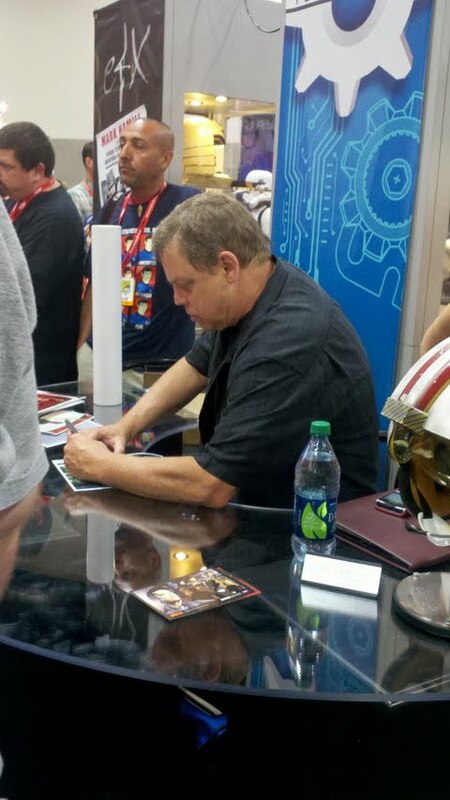 Jim is pretty much the monarch of this year’s Comic-Con and was taking a rare and much deserved break from from all his panels and signings. 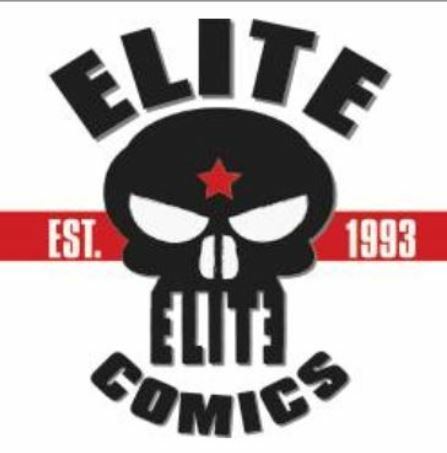 He and his wife were having a great time and you can tell the pressure of the new DC Comics 52 re-launch is only providing him with extra excitement and energy to roll out a great new line of comic titles for fans this fall. Here’s a photo of us at lunch in the Gaslight District. We also got to meet the ubiquitous actor Mark Sheppard (Doctor Who, Battlestar Galactica), his wife and four kids. 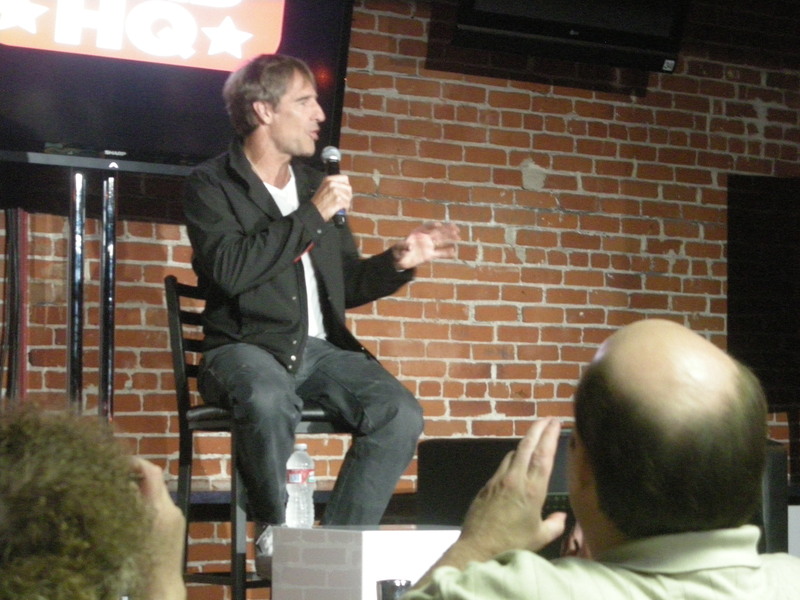 I will post separately about our chat with Mark later. We had great conversations with the guys from Profiles in History, too, who currently star in the SyFy reality show Hollywood Treasures. Very fun to see these guys are fans like the rest of us! Profiles in History was selling photos in one of the Back to the Future DeLoreans for Michael J. Fox’s charity. A great idea and a great cause! This was a Comic-Con favorite of the day. And here is Elizabeth with our friend Kevin Dilmore at the Hallmark booth. 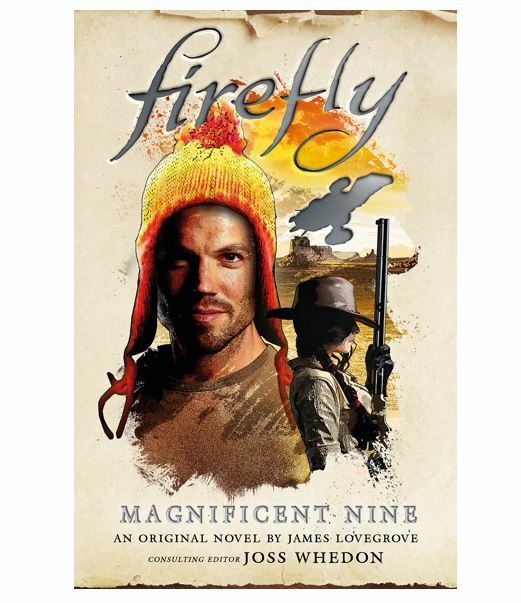 Kevin (along with his writing partner Dayton Ward) is THE favorite Star Trek novelist of fans. And we had a blast roaming with borg.com writer Jason McClain! We’ll post more photos in the coming days, but please let us know if you see us on any other websites!